It seems so long ago that I did Ann's senior photos. And while it really wasn't, it makes it seem AGES ago when you're doing her ENGAGEMENT photos! This will probably be up there with one of my favorite sessions because... can you say "fog, the Sound, red velvet, movie theater popcorn and all of the laughter"!? All together now! Ann and Abram met while working at a movie theater in high school and I love that we got to have fun with this! While I'm not one for props, there's a time and place when props can be truly meaningful and not just Pinterest copies. Before Ann & Abram's shoot we quickly chatted about their location in further detail because I'm a firm believer in having photos done in places that mean something to you. While my style will still play a part in the choosing due to colors, lighting and the artistic side of things, I want my clients to look back at their photos and feel something. After bringing this up, Ann was quick to tell me of Jerisich Park in Gig Harbor where Abram not only proposed to Ann, but she hinted that they may or may not have snuck out of their houses late at night to meet here while in high school. Be still my heart. With Abram shipping out with the military on the weekend, we quickly set up their photos and crossed our fingers that the rain would hold since we weren't able to reschedule. Instead of downpours, we were greeted with the most beautiful soft fog, filling the skies with that overcast weather perfect for beautiful skin tones. Yes, yes, yes. These two laughed, nuzzled and fed each other popcorn and ended with slow dancing on the dock with an audience of seagulls. 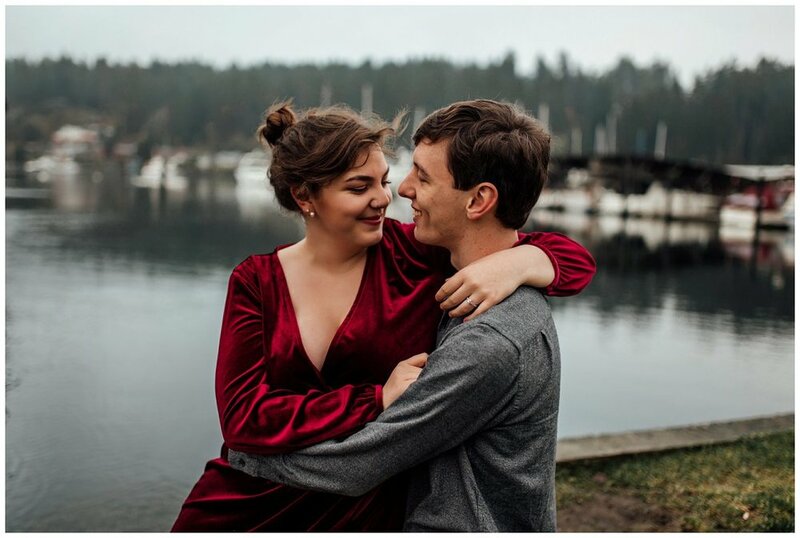 If you're all about savoring the moments with your loved one and are in need of engagement or just updated photos together, I'd love to chat! Click on my Invest tab for pricing details and the Contact tab to reach out!